INDEPENDENT TD DR Michael Harty has said that he disagrees with his Independent TD colleagues on the new, stricter penalties for drink driving legislation, saying that it was an “important” aspect of road safety. Independent TDs Mattie McGrath, Michael and Danny Healy-Rae have been vocal in their opposition to the changes, championed by Minister for Transport and Independent TD Shane Ross, which sees a more strict penalty for those caught driving while under the influence of alcohol, even if that’s a small amount of alcohol. In an interview with TheJournal.ie about a wide range of healthcare issues, Harty explained that he differed from his rural colleagues on Ireland’s newly-changed drink driving laws when viewing it from a medical perspective. I was looking at it from a GP’s perspective as a piece of road safety legislation. I think that it is important that people realise that they can’t drink and drive. The day of just two will do is no longer acceptable. The new regulations remove a concession in previous legislation by which some drink drivers received penalty points instead of being disqualified. It now means that all drink drivers, without exception, will receive a driving disqualification for three months if they are caught above the legal limit. 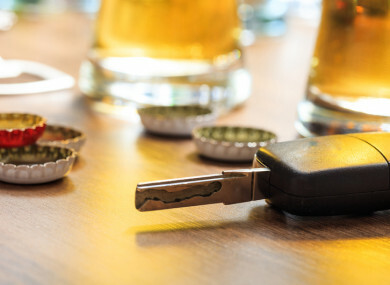 Rural TDs had argued that the legislation was too harsh, and could mean that someone gets their drivers’ licence revoked if driving the morning after a bout of drinking. They are still liable to cause an accident, libel to cause an injury to themselves, or to other road users. “It seems harsh, but nevertheless, they are still over the legal limit,” he says. He said that the proposals to allow exemptions for those who were caught over the legal limit and have had their licence revoked to allow them to drive to work was an “interesting proposal”. “If it can be proven that it’s going to seriously impinge on your ability to function in society, perhaps being allowed to drive in a curfew period should be an option,” Harty says, though he doesn’t know “how it would work out practically”. In a separate part of the interview, Harty said that there was a concern among some rural GPs that they could be targeted by anti-abortion protesters if they are the only one in an area providing those services to the public. He also said that the 1 January date set by Health Minister Simon Harris, by which abortion services should be made available in Ireland, was “very ambitious” and has led to the “sporadic availability” of abortion services around the country. This week, the Rural Independents Group, including Harty, put forward a Private Memebers’ Bill on the National Children’s Hospital, calling for construction to be suspended immediately at the St James’ site. The motion was rejected by the Dáil; Tipperary TD Mattie McGrath released a statement criticising the Fianna Fáil and Labour’s “absolutely bewildering decision to proceed at this disastrous site”. But Michael Harty, who is also the chair of the Oireachtas Health Committee, said that it would be “very difficult” to suspend construction at the site. The project, which has been hounded by problems since its inception, has been disrupted recently by spiralling costs of completing the hospital; jumping from over €900 million to almost €2 billion. An assessment of how costs increased has been set up by the government – but the cost of carrying out this assessment has also increased (from €450,000 to €600,000). The capital project has also been caught up in a debate over whether St James’s is the appropriate site for the new national hospital. It was originally meant to be located on a site next to the Mater Hospital in Phibsborough, north Dublin. But after An Bord Pleanála refused planning permission, it was decided that it would be co-located at a site next to St James’s Hospital. Approximately €40 million was spent on moving the plans to a new site. Harty believes that the hospital should have been built at Connolly Hospital site Blanchardstown, even though it was more important to be co-located next to a maternity hospital rather than a teaching hospital. The greenfield site in Blanchardstown would have been a better site than St James’s… certainly, if one was to relive or go back, it would have been more appropriate. The Blanchardstown site is said to have been more appropriate because of the room available to expand the hospital; critics of the St James’ site say that within 10 or 20 years, that the current Children’s Hospital plans won’t meet the demands of the population. It’s a very interesting issue because, many paediatric specialists say that if we enter a new way of healthcare, where we look after more and more people in the community, internationally the length of stay for children now is reducing. So if change paediatric care to the peripheral hospitals such as Cork, Limerick, Galway, Waterford, and just have the new paediatric hospital dealing with complex and urgent care, the bed requirement actually reduces, provided we change our model of care. He adds that because of technology advances, the bed requirement may be sufficient but that the ancillary add-ons that the hospital will need and ability to expand “won’t be there, or will be very tight”. In February, after Sinn Féin tabled a motion of no confidence in Simon Harris as Health Minister, Harty voted against Harris. This came after a number of issues facing the government, all involving the healthcare sector, including the nurses’ strike, the cost of the National Children’s Hospital, and issues around the CervicalCheck programme. “The current waiting period of 6 months or more is unacceptable,” Harty says on this, “I’ve had patients that had smears done in August who haven’t had their results back yet. If the offer of out-of-cycle smears was to reassure women, it certainly hasn’t done that… and has undermined people’s confidence in the CervicalCheck programme. Although he had previously intended to abstain, Harty changed his mind after hearing that the additional funding needed to prop up the increasingly expensive National Children’s Hospital would mean that a 60-bed modular unit for University Hospital Limerick would be delayed. “This is one failed commitment I cannot accept,” he said at the time, stating that Harris appeared in front of his health committee and gave a number of statements to the Dáil where he pledged that the hospital unit “would be delivered on and delivered on by 2019″. Since drawing attention to the issue, Minister has said that money will be made available. When the HSE plan is published, according to Harty, Simon Harris has committed that funding for the unit will be made available. But after the modular unit is built, there is a third element of construction where staff are trained for the new unit, and “that money hasn’t been made available”. “So I think the 60-bed modular unit won’t be ready until 2021 at the earliest,” he says. Email “Clare TD Michael Harty: 'I took a different view from my rural colleagues on the drink driving laws'”. Feedback on “Clare TD Michael Harty: 'I took a different view from my rural colleagues on the drink driving laws'”.